July 30, 2011 /Photography News/ Amateur and professional photographers are invited to participate in diverse daily photo contests online at PhotoRush.com. Every day different contest take place and everyone can participate for a chance to win cash and other valuable prizes. The winners of the daily contests can join for free the weekly photo contest with prizes ranging from 70 to 500 Euro. Additionally, daily contests winners are automatically entered into the monthly photo contest. How to enter in the photo contests at PhotoRush.com? There are 12 categories and the minimum number of participating photos is 10. There are 6 different themes and the minimum number of participating photos is 30. 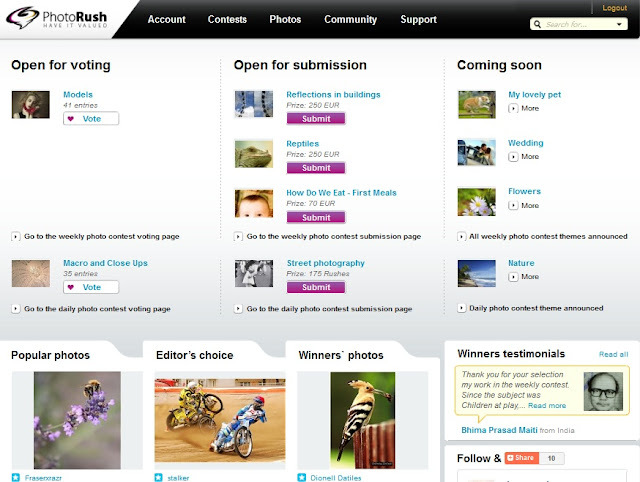 How to win a photo contest on PhotoRush.com? For more information visit PhotoRush.com.